Elderberry Flower Bavaroise is a Dutch food recipe for a creamy pie. Put the vanilla, black berry puree and the syrup in a pan. Heat the mixture until it almost reaches boiling-point. Squeeze out the excess liquid from the gelatine. Then add the gelatine to the mixture, stirring constantly. Keep stirring with a wooden spoon until all the gelatine has dissolved. Add the egg yolk after the dissolved gelatine, stirring constantly. Make sure that the mixture doesn’t start boiling. Remove the pan from the heat. Pour the cream in a large bowl and whip the cream until stiff. Put it in the refrigerator. Place the pan with the hot mixture in a bowl with ice water and keep stirring. Immediately as the mixture starts to set, carefully fold it with a spatula into the whipped cream. Fill the pastry shell with the bavaroise and quickly even the surface with a clean spatula. Store the bavaroise in the refrigerator until needed. 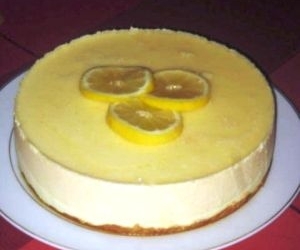 Cut the bavaroise with a sharp knife in nice portions and decorate with lemon slices.